The New Motiv Venom Shock Pearl is the long awaited Pearl Shock people have been looking for. Motiv has wrapped the Hexion Pearl cover on the Top Gear core to provide easy length with a nice angular back end motion. Motiv felt that the dual density core provided a better back end than the original Shock core and you will not be disappointed. When I first took the Venom Shock Pearl (VSP) to the lanes I felt like it was not picking up quick enough. I had also heard of some staffers hitting the VSP with 2000 or 3000 to solve this issue. Wait before you change the surface! After a few different lines and releases to combat the length I noticed something odd. At about the end of game two the ball started to read earlier and hook more down lane. This effect continued until I had about 6 games on the ball and it is much better “broken in” than out of box. This is the first or second ball by Motiv that I ever felt needed a few games on it before we saw what it could do. My VSP hooks a bunch more now than out of box with no surface changes at all. I just clean it after every set. Let’s take about performance. The Venom Shock Pearl gets easy length with a nice predictable angular back end. This ball has great carry and excellent hit. The VSP will be a great ball to go to when the Original Shock is too strong or early. The Venom Shock Pearl drives through the pins with great continuation. The VSP fits just under my Shock but above the Tag Cannon. If you are a higher rev player or want to square up on medium to dry conditions this will be a good choice. I have not tested this ball on a lot of patterns but for our house shot, when I want to go a little straighter, or when bowling on dryer conditions this ball is excellent. The color is beautiful in person. It will definitely get noticed on the lanes and on the shelf. The Venom Shock Pear is a great ball for the price point. The Pearl cover provides easy length and the Top Gear Core helps back end angle. A great ball when the Original Shock is too strong. If you missed out on a Panic, or like the Panic you will love this ball. Venom Shock Pearl (noun) : 1. The perfect complement to the Venom Shock Pearl which is one of the most popular Motiv balls created due to its versatility. 2. Weaponry that features the new Hexion cover and a dual density Top Gear weight block. 3. Weaponry that provides easy length and a fast response to friction and features the new Hexion MFP (Medium Friction Pearl) coverstock with a 5500 Grit LSP finish. The Venom Shock Pearl out of box is very clean and that is because of the Hexion coverstock, I for one am I huge fan of the Hexion coverstock which is why outside of scientific purposes I keep mine at box. At box the Venom Shock Pearl is indeed an exact opposite of the Venom Shock from a ball motion stand point as the Venom Shock has more traction up front and a heavier roll to it, the Venom Shock Pearl is much cleaner through the front part of the lane not being as traction heavy out of box. I did apply surface to the VSP and that is when I found it to be a mirror image of the Venom Shock just in Hexion clothing, smooth traction is what I call it as I saw the ball pick up earlier but it wasn’t expending a lot of energy doing so. I feel that those that like to sit on top of the ball will apply surface to the VSP to make it more roll heavy and suitable for their needs, while those that do not may leave it at box. The layout I went with was 40 x 4 50. I chose this layout because of how clean Hexion is I wanted a stronger layout to pair it with and I ended up getting more than what I asked for, I wanted big and smooth and I got giant and smooth. The VSP didn’t disappoint in the heavier oil however when I missed at the bottom of my swing (with the VSP at box) the Hexion cover is so clean that it will skate through the breakpoint, when I missed at the bottom of my swing with the VSP with surface (green scotch brite) it was a more giving as it would sit up. The Venom Shock Pearl is indeed a ball that does as advertised as with any weaponry made by Motiv. I encourage you to give the Venom Shock Pearl a look. The Venom line is back in a bold new way with the Venom Shock Pearl. The combination of the Top Gear core (2.47RG, .035Diff) from the Cobra with the brand new Hexion MFP coverstock (5500LSP) captures the essence of the original Shock while providing a different motion; this has created a strong 1-2 punch. The VSP has been designed to skid further down the lane while providing more recovery than its original namesake so that it can be used later in the day once the OG Shock starts to hook too early. I drilled mine the same way as my longest tenured Shock (and most successful!) and also hit it with a light 3000 pad to get it to the same finish to give a true comparison. While these two reacted with the pins the same (keeping them low and on the deck for better carry), their reactions are vastly different. This iteration of the Hexion cover continues to impress with its reaction time to friction while the core keeps the ball in control. The VSP goes several feet further down the lane and responds to the friction significantly quicker. This motion allows me to get further left on the lane and still get the corners out where the OG Shock would start to burn a little early. Taking the polish off of the box finish has allowed me to use this ball on the fresh without sacrificing control. With the polish back on I get a ball that can continue going left so that I may keep that reliable Venom reaction in my hand even longer. If the Venom Shock is a staple in your bag then the Venom Shock Pearl is a must-have enhancement to that arsenal. Hello guys! This time I had the chance to try the new Motiv Venom Shock Pearl. The Venom Shock has been one of my favorite bowling balls. My 2 perfect games has been shot with the Venom Shock and my highest series has been also shot with the Venom Shock, so when I found out about the Venom Shock Pearl, I got really excited. The Venom Shock Pearl is designed to be a cleaner and more angular version of the original Venom Shock and it does exactly as advertised. I tried this ball on our fresh house shot pattern (Kegel Main Street, 41') and I was able to play straighter up the lane and the VSP found the pocket easily. The Venom Shock Pearl has a smooth and predictable roll. It revs up quickly but it pushes farther down the lane to provide a strong, but controllable backend motion. When I missed outside my target, the ball offered enough recovery to hit the pocket, leaving some corner pins when I missed too far out. Misses inside were not as forgiving as misses outside. The ball doesn't have a skid-flip motion, but it offers enough length to feel comfortable knowing that the ball will never hook too early and that it will have enough energy to provide a strong shape down the lane. I compared the Venom Shock Pearl with the Venom Shock and the Lethal Paranoia. The Venom Shock is stronger overall. It has more hook potential, is earlier, smoother and it has a slower response to friction. The Lethal Paranoia is a tad cleaner than the Venom Shock Pearl and it is more angular since it has a faster response to friction. Overall, the Lethal Paranoia is stronger than the Venom Shock Pearl. The Venom Shock Pearl is a great complement to the Venom Shock and a great step down from the Lethal Paranoia. When the Venom Shock gets lazy down the lane or is reading the lane too early, the Venom Shock Pearl will be a great option to go to. When the Lethal Paranoia is too much ball or becomes too angular, the Venom Shock Pearl will provide a similar shape, with a smoother motion down the lane. Overall, the Venom Shock Pearl is a great addition to the Motiv lineup. The Venom Shock Pearl is a great option on broken down patterns. Once there is some friction and you need more length and more shape down the lane, the VSP will be a great ball to go to. Bowlers who are currently using the Venom Shock will find in the Venom Shock Pearl a great complement and a versatile piece that will fit into a lot of bowling styles. Low rev, speed dominant bowlers will be able to use this ball playing straighter angles, while rev dominant bowlers will be able to move in and play steeper angles on most medium and light oil conditions. [The Venom Shock Pearl Is Absolutely Amazing ! I drilled the VSP with my favorite pin up layout. I like this layout the most because it creates a motion on the lane that allows me to the read the lane easier front to back. The top gear core (low rg) gets the ball started pretty early for a lighter oil ball, while the Hexion pearl cover at 5500 box finish with the lower differential allows the ball to still get down the lane easy and effortlessly, creating a pretty quick response to friction. Most bowlers will find that this ball will be an asset later in tournament blocks or after your house pattern is broken down with the box surface on it. I found it works even better when using a 1000 or 2000 abralon pad to break the shine on the box finish. It will handle more of a medium length/volume pattern, including starting with it on your house patterns. The Venom Shock Pearl is the latest release from MOTIV Bowling. It brings together the Top Gear core at the Hexion Cover makes a great compliment to the original Shock and is a great piece for medium conditions. With the Top Gear core and the Pearl Hexion Cover, the Venom Shock Pearl provides easy length when there is friction on the lanes and has tremendous angular backend through the pins. If you loved the original Venom Shock, and honestly who wouldn’t, then the Venom Shock Pearl is for you. When it was first announce that MOTIV was coming out with the Venom Shock Pearl, I couldn’t wait to punch up and boy it did not disappoint. The VSP is such a great piece in my bag because it’s the first ball out of my bag for league. Where I bowl, there is a lot of friction down lane with lots of backend and I need something that will get me done lane without losing the pocket and the VSP gives that to me. With the original Shock and along with the Lethal Paranoia, I got a great league line up and I think MOTIV fans will love this piece just as much as I do. Medium to higher rev player will love the VSP because it’s great to get down lane and lots of backend that just destroys pins. Lower rev players will love the VSP because when the Shock becomes a little too much, switching to the VSP will keep them in their comfort zone. Likes: Easy length; Lots of backend; Continuation like no other. 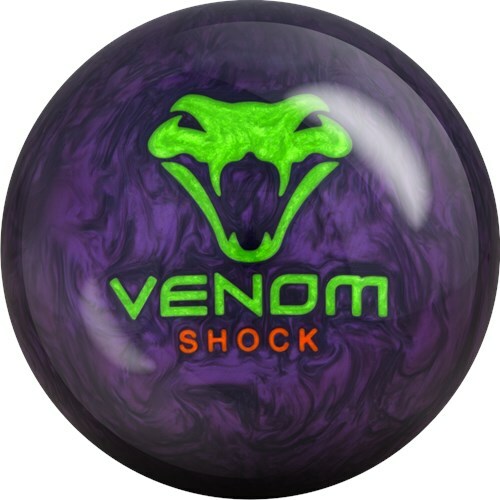 I recommend the Venom Shock Pearl for all types of bowlers. I compared my Venom Shock Pearl to none another than the original Venom Shock. The Venom Shock Pearl immediately displayed how much cleaner through the front part it is. On the fresh house shot, it is unbelievable how well it performs for me. With the low RG core inside wrapped with the Hexion cover, the ability it has to read into the friction early AND have a very controlled, angular reaction is unreal. The 1-2 combination with the original Venom Shock can go either way – if the VSP needs a little earlier motion, the Venom Shock can help blend it out. If the Venom Shock can’t quite make the corner at the breakpoint, the VSP will. This Hexion Cover technology added with one of the most popular balls ever, there is nothing not to like about the Venom Shock Pearl. For some, especially the avid tournament player, a little additional surface will have unlimited uses for it. The performance that the VSP brings is going to be impactful for quite a while. The Venom Shock Pearl has earn a spot in my bag everywhere I go. With great anticipation I had been waiting for this ball to hit the market. The question to be was how is this ball going to stack up against the OG Shock? Was I going to drill this ball the same as the OG? Do I use another lay out? There were so many questions running through my head with this nugget. Ultimatly I chose to use the same lay out as my OG Shock. Keep in Mind the Shock I have in my bag is the first shock I drilled 4 years ago when that ball came out. I have never drilled another, I have one under lock and key in case I need it. The VSP was laid out using 55 X 4.5 X 60, this puts the pin just below my bridge and kicks the CG about 1/2" from my center line. This is my favorite pin down lay out. This layout allows the ball to clear the fronts well, read the midlane where I like to see shape and have great continuation. With my "trick" roll I have a tendency to see the midlane a little more than most, my PAP is 4.375 over and .5 up. My tilt is very limited in my A release, I almost never use strong pin placements as the balls tend to puke off the back then. What does the VSP do for me? The VSP is as advertised. Clean through the fronts and reads the midlane well for a pearl ball. I am not one to change covers on pearl balls, I like to see what a ball does on a variety of conditions with the stock cover on pearls. The last few releases from Motiv, for me are too clean through out the lane as a whole. Then when they encounter friction they have been to violent off the spot. The cover on the VSP, does not seem to have these issues. The VSP sees the lane with ease, not over reading the friction and allows the ball to mellow the spot down lane. This ball to me hearkens back to the older reaction, allows me to keep the ball in the wax a little longer and open up the angles with out over seeing the dry. To me this cover reminds me of the OG Paranoia cover, clean, predictable and strong. All in all the Strong pearl cover with a dual density core allows this ball to really dig in mid lane and still open up the angles, this ball is a Must for tournament and league players. The Bowler: 450+ rev rate, 16mph (breakpoint), 60 deg axis rotation, 10 deg tilt. The Venom Shock Pearl is everything as advertised, easy through the heads, picks up the midlane nicely, and make a continuous move at the break point. I would not call this ball angular whether cover stock and/or core it's very controllable. Having tossed a Hydra I would almost put that ball directly right of the VSP and not in the light oil class but I would assume Motiv wants to keep a dedicated venom line. Now to get more detailed and not spew anything you haven't already read off the website... I found this ball to be very close to one of my all time favorite pearls the low RG low diff Storm IQ Tour Pearl. Motiv wise close to the Venom Panic but cleaner and touch more continuous off friction. The coverstock / core combo is a high rev bowlers friend. You can create multiple angles to the pocket and the ball responds very well to hand positions. I thrown a bit of new equipment lately and struggled with marketing placement of ball reaction. Not really having a need for heavy oil equipment I've tested a lot of middle and lower volume stuff. My biggest issue is most coverstocks on lighter oil react wayyyy to strongly to friction and are very sensitive to oil. The VSP allows you to cover a healthy amount of boards while still hooking enough in oil to make it more playable on a wider range of conditions. Highly recommended for the bag. Page created in 0.704 seconds with 22 queries.